The American Recovery and Reinvestment Act of 2009 charged the US Federal Communications Commission (FCC) to develop and deliver to Congress a national broadband plan by February 17, 2010. The FCC formally commenced the process of developing the plan by issuing a Notice of Inquiry (NOI) on April 8, 2009. The NOI identified broadband issues and critical questions and asked stakeholders to respond to these issues and questions with data and analysis. The purpose of this chapter is to analyze the written documents generated by stakeholders’ responses concerning the specific issues of open networks and competition and to make recommendations to the FCC in its formulation of federal policy as to the position that makes the most economic sense on these issues. We find that many of the arguments and concerns of stakeholders are dependent upon predictions regarding the competitiveness of ISP markets. We predict with confidence that technological innovations are likely to make many legal arguments (on all sides) obsolete in the near future. The American Recovery and Reinvestment Act of 2009 (Public Law No. 111-5, 123) charged the Federal Communications Commission (FCC) to develop and deliver to Congress a national broadband plan by February 17, 2010. The FCC formally commenced the process of developing the plan by issuing a Notice of Inquiry (NOI) on April 8, 2009 (FCC, 2009). The NOI identified broadband issues and critical questions and asked stakeholders to respond to these issues and questions with data and analysis. As of the end of September 2009, over 1,000 comments and replies have been submitted to the FCC. The purpose of this chapter is to examine the written documents generated by stakeholders’ responses concerning the specific issues of open networks and competition (sections C. 5. and 6. in the NOI) and indicate how these issues can aid in the achievement of the nation’s broadband goals. Also, the chapter makes recommendations to the FCC in its formulation of federal policy as to the position that makes the most economic sense on these issues. 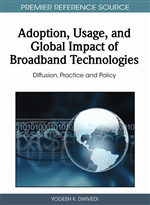 While the focus of this chapter is on how public policy in the Unites States can promote adoption, diffusion, and utilization of broadband, it should be recognized that there is a significant body of earlier research that examines demand and supply factors that influence broadband adoption and diffusion. For instance, Papazafeiropoulou and Dwivedi (2009) review 49 studies examining broadband adoption and diffusion in developed and developing economies and construct a framework that consists of a listing of and number of studies associated with factors that influence adoption and diffusion decisions at the national level, the consumer level, and for small and medium size enterprises. In particular, with respect to consumer adoption and usage, the authors identify 34 key micro factors that include demographics/user characteristics (14 papers), cost/price/subscription fee (11 papers), and content/applications (6 papers). Another line of empirical research examines households who have chosen not to subscribe to broadband and compares them to consumers who have adopted broadband. For example, Dwivedi and Irani (2009) find empirical support to suggest that there are factors other than subscription fee and speed of access that matter to non-adopters. In particular, to increase consumer adoption of broadband, non-adopters must perceive that broadband is better than narrowband and that broadband will enhance the effectiveness of household activities. Increased deployment of advanced broadband networks to unserved and underserved regions of the nation, such as the states of Mississippi, West Virginia, Alabama, New Mexico, and Montana. (We refer to this as a supply side goal.) The FCC estimates that between 3 and 6 million homes do not have access to a broadband connection, defined as speed in one direction of 768kbps or more (Schatz, 2009b). Increased adoption of advanced broadband service by end users. Specifically, what needs to be done to convince the remaining 33% of the residential home population to perceive sufficient value to justify a subscription for broadband service? Increased utilization of advanced broadband networks by end users. (We refer to goals b. and c. as demand side goals.) As end users increase their utilization of broadband service by demanding higher bandwidth services, this goal will require network providers to increase the capacity of their existing advanced networks.